Money for the sake of money is not an end in itself. You cannot eat dollar bills or wear your bank account. Ultimately, money is only useful because you can exchange it for goods and services. As the American writer and humorist Ambrose Bierce (1842–1914) wrote in 1911, money is a “blessing that is of no advantage to us excepting when we part with it.” Money is what people regularly use when purchasing or selling goods and services; thus for something to be considered money, it must be widely accepted by both buyers and sellers. This concept of money is intentionally flexible, because money has taken a wide variety of forms in different cultures. To understand the usefulness of money, we must consider what the world would be like without money. How would people exchange goods and services? Economies without money typically use the barter system. Barter—literally trading one good or service for another—is highly inefficient for conducting transactions. In a barter economy, an exchange between two people requires a double coincidence of wants, which means that what one person wants to buy is exactly what the other person wants to sell. This is harder than it sounds. Suppose an accountant wants a new pair of shoes. The accountant doesn’t just need to find someone who has a pair of shoes in the correct size to sell, but they have to find a person who will also be willing to exchange the shoes for what the accountant has to offer, namely accounting services. Trades like these are likely to be difficult to arrange. Now imagine how this would work in a complex, modern economy, with its extensive division of labor that involves thousands upon thousands of different jobs and different goods & services. The number of transactions that end up taking place is likely to be much smaller than in an economy with money. Another problem with the barter system is that it does not allow us to easily enter into future contracts for the purchase of many goods and services. For example, if the goods are perishable it may be difficult to exchange them today for other goods in the future. Imagine a farmer wanting to buy a tractor in six months using a fresh crop of strawberries harvested today. Because the strawberries won’t last, such a transaction is unlikely to occur. While a barter system might work adequately in small economies, it will limit these economies’ growth. The time that individuals would otherwise spend producing goods and services and enjoying leisure time would instead be spent bartering. Money solves the double coincidence of wants problem. First, since money is generally accepted as a means of payment (or medium of exchange), the accountant can pay for new shoes with money, which the shoe seller is willing to accept (even if they don’t need accounting services) since he or she can use the money to purchase something they do need. Second, people are willing to sell something for money, even if they have no immediate need to purchase something else, because money serves as a store of value. A store of value is anything that holds value. Some things are better stores of value than other things. Real estate has traditionally been a good store of value since it tends to increase in value over time. Shoes are not a particularly good store of value, because they wear out as you wear them, and even if you don’t, styles change over time making what used to be a stylish pair of shoes, nothing special and thus worth less today. Money doesn’t have to be a perfect store of value to be acceptable. In an economy with inflation, money loses some buying power each year, but it remains money. Third, money serves as a unit of account, which means that it is the ruler by which other economic values are measured. If there were no unit of account, the price of every good or service would have to be expressed in terms of the price of every other good and services. What you pay would depend on what you had to sell! Businesses would have to keep track of the value of everything someone might sell in order to be able to decide on a price for their products. Money solves the problem by acting as a common denominator, an accounting method that simplifies thinking about trade-offs. Learn more about the functions of money in this video clip. One additional function of money is that it must serve as a standard of deferred payment. This means that if money is usable today to make purchases, it must also be acceptable for contracts signed today that will be paid in the future. Loans and future agreements are stated in monetary terms and the standard of deferred payment is what allows us to buy goods and services today and pay in the future. Money is anything that can serve all of these functions— it is a medium of exchange, a store of value, a unit of account, and a standard of deferred payment. Money has taken a wide variety of forms in different cultures. Gold, silver, cowrie shells, cigarettes, and even cocoa beans have been used as money. These items are examples of commodity money, which means they also have a value from use as something other than money. Gold, for example, has been used throughout the ages as jewelry or art, as well as money. Gold is a good conductor of electricity and is used today in the electronics and aerospace industry. Gold is also used in the manufacturing of energy efficient reflective glass for skyscrapers and is used in the medical industry as well. Figure 1. A Silver Certificate and a Modern U.S. Bill. Until 1958, silver certificates were commodity-backed money—backed by silver, as indicated by the words “Silver Certificate” printed at the top of the bill. Today, U.S. bills are backed by the Federal Reserve, but as fiat money. (Credit: “The.Comedian”/Flickr Creative Commons). As commodity money, gold has historically served its purpose as a medium of exchange, a store of value, and as a unit of account. Commodity-backed currencies are dollar bills or other currencies with values backed up by gold or some other commodity held at a bank. During much of its history, the money supply in the United States was backed by gold and silver. 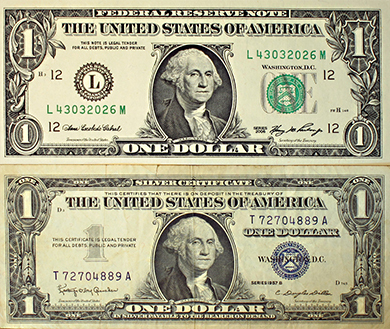 Interestingly, antique dollars dated as late as 1957, have “Silver Certificate” printed over the portrait of George Washington, as shown in Figure 1. This meant that the holder could take the bill to the appropriate bank and exchange it for a dollar’s worth of silver. As economies grew and became more global in nature, the use of commodity monies became more cumbersome. Countries moved towards the use of fiat money. Fiat money has no intrinsic value, but is declared by a government to be the legal tender of a country. The United States’ paper money, for example, carries the statement: “THIS NOTE IS LEGAL TENDER FOR ALL DEBTS, PUBLIC AND PRIVATE.” In other words, by government decree, if you owe a debt, then legally speaking, you can pay that debt with the U.S. currency, even though it is not backed by a commodity. The only backing of our money is universal faith and trust that the currency has value, and nothing more. This video provides an overview of how money has evolved through the ages. whatever serves society in four functions: as a medium of exchange, a store of value, a unit of account, and a standard of deferred payment.